Manchester United’s lamentable submission to West Ham United on Saturday emphasised what we already knew. 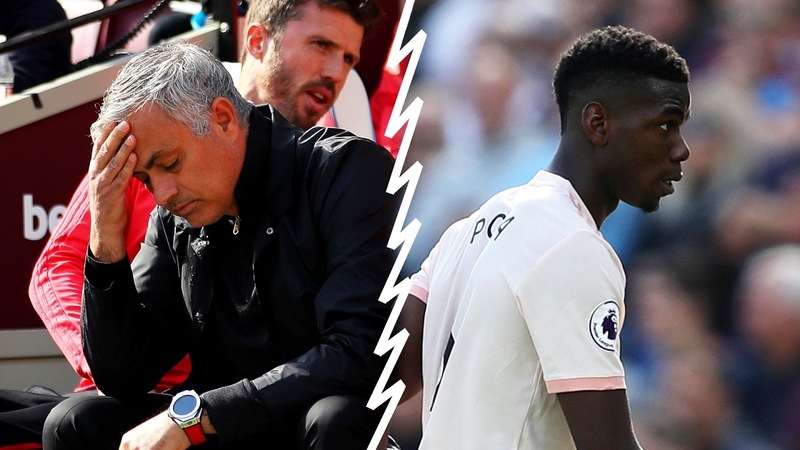 Jose Mourinho’s problems go far, far deeper than his spat with Paul Pogba. The sideshow split between player and manager has hogged the headlines of late, but the issues facing Mourinho clearly don’t start and end with the French midfielder, and on the evidence of the 3-1 loss at the London Stadium very few of the United squad are playing for their boss right now. United legend Rio Ferdinand’s comments to BT Sport before kick-off were telling. “In the past we’ve seen managers relieved of their duties, that’s what would normally happen,” said the six-time Premier League winner. Ferdinand sounded like he was speaking from a position of knowledge, and these were certainly not the words a former player and huge fan of the club would normally proffer unless there was some substance. Moreover, United’s abject performance spoke far more obviously and loudly than did Ferdinand in that there was absolutely nothing about their display which suggested they were a tight unit looking to back their manager out of a corner. The United boss, famed for his ability to draw out off-field sagas in the hope of deflecting attention to his shortcomings in gaining results, can no longer cover up the fact that things are going horribly wrong. Having dropped Alexis Sanchez completely from his matchday 18, questions will begin to be asked as to whether he has done the right things in attempting to coax performances out of the under-par Chilean. He has already had public run-ins with the likes of Pogba, Luke Shaw and Anthony Martial – along with an apparent falling-out with Eric Bailly and recently raising question marks about Marcus Rashford’s attitude. Mourinho is certainly doing little to help his cause in terms of winning over support within the group. Starting Scott McTominay as a centre-back was another move that looked primed to backfire and it took less than five minutes for Felipe Anderson to peel off the back of the young midfielder far too easily and delightfully flick home unmarked for West Ham’s opener. And while the Hammers’ second, an own goal off Victor Lindelof from Andriy Yarmolenko’s shot, carried a lot of fortune, the 2-0 scoreline was a clear reflection of the difference in approach from the two sides. The home side were purposeful and industrious, but United just stood by and watched a far inferior team without laying a glove on them. In the second half there was a slight change in emphasis but to nothing like the kind of level needed to work their way back into the fixture. They were every bit as disjointed as they were unenthused, giving the impression of a mid-table team riding out the final game of a long Championship season rather than prospective challengers in the Premier League. Moments after Pogba had been hauled off, Rashford pulled one back with a delicious flick from a left-wing corner but West Ham almost immediately stepped up their game and Marko Arnautovic was left free to put the game beyond doubt with McTominay and Chris Smalling practically in different area codes. With just 10 points in their opening seven games, this is United’s worst start to a league season since the 1989-90 campaign during which Sir Alex Ferguson was on the verge of getting the sack until Mark Robins’ winner against Nottingham Forest eased the pressure on the Scot. But the current malaise which Mourinho has helped to engineer seems far more concerning than even that which faced Ferguson. United are in an utter state, and if Mourinho is to turn this around he is going to need his entire squad sticking behind him and fighting tooth and nail for the cause. Judging by this display, he is a million miles from getting anything like that out of these players.